Former White House RAT Omarosa Manigault-Newman is on a warpath against Donald Trump and his inner circle. Omarosa claims in her soon-to-be-released book titled, “Unhinged: An Insider’s Account of the Trump White House,” that First Lady Melania Trump plans to divorce Donald Trump as soon as he’s out of office and she “punishes” her husband by her choice of wardrobe. Omarosa also says the First Lady punished her husband when she wore a trench coat that read, “I REALLY DON’T CARE, DO U?” when she visited the child immigration detention center in Texas. 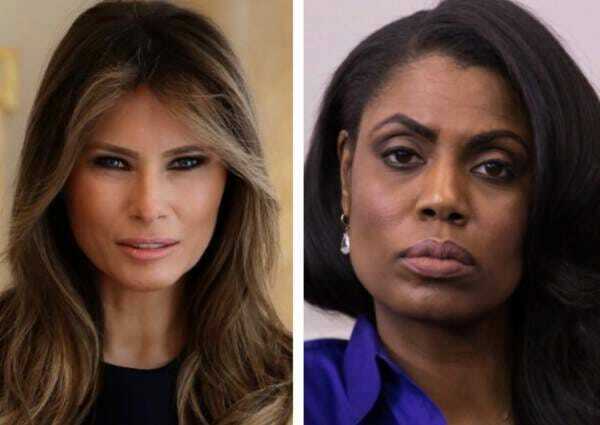 Mrs. Trump rarely, if ever, interacted with Omarosa. It’s disappointing to her that she is lashing out and retaliating in such a self-serving way, especially after all the opportunities given to her by the President. The bitter former staffer also accused Donald Trump of using various racial slurs such as the n-word several times. President Trump called Omarosa a “lowlife” on Saturday in response to a reporter who asked him if he “felt betrayed” by the former White House aid. Calls for Omarosa to be prosecuted are growing after she released a secret recording of Chief of Staff John Kelly firing her.